Woot! 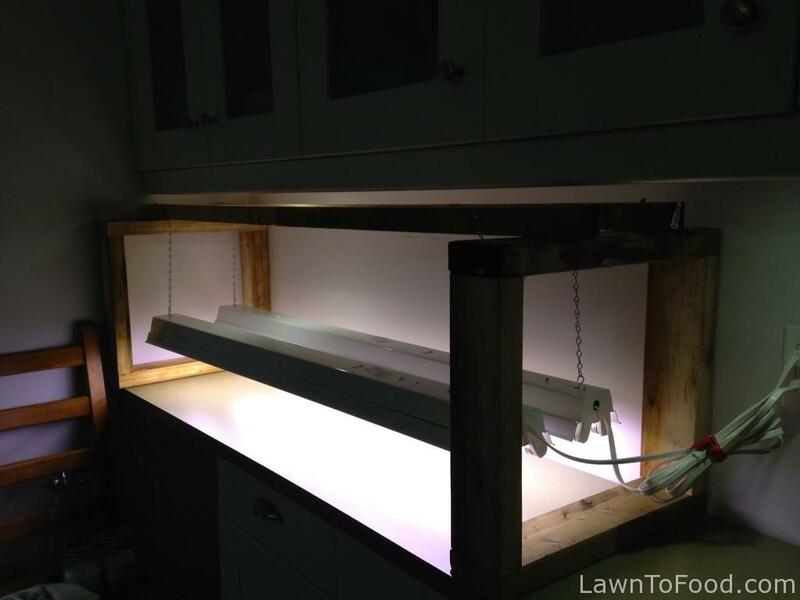 I completed my new growlight project! 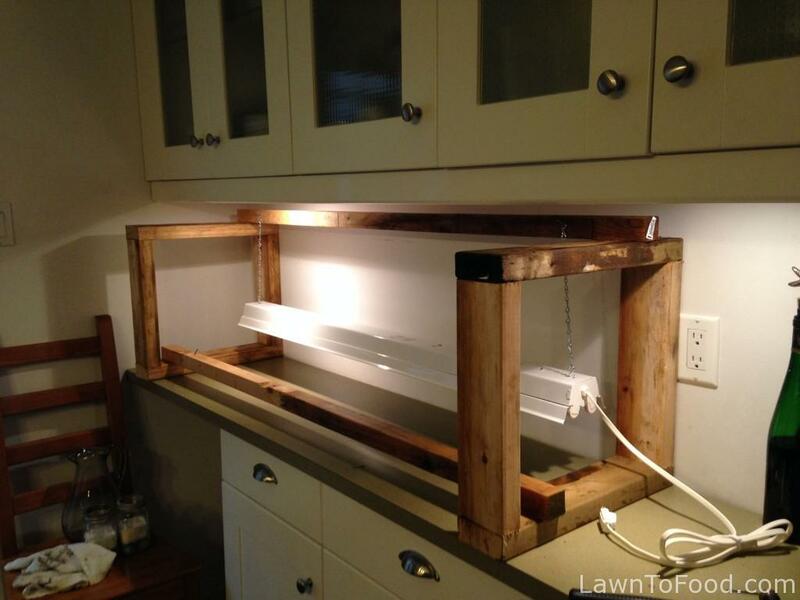 If you are going to create some homegrown growlights, I highly recommend that you educate yourself on exactly what you need to purchase, before going to the hardware, or plant supply store. The electrical department clerk that helped with my venture, tried to sell me 4 bright white LED fixtures for growing seedlings. Not only were they twice the price ($72 each), they wouldn’t have done the job adequately. Check HERE for some information about the different types of grow light options, and then do more research to find out what will suit your needs the best. I decided to purchased four 4′ long ShopLight fluorescent light fixtures at a cost of $23 each, which included chains and hooks to hang them. For each fixture, I purchase 2 special fluorescent plant & aquarium bulbs that have a unique full-spectral range which is designed to enhance the growth of indoor and aquatic plants ($7 each). In total, each hanging fixture, including bulbs, cost me $37. I will recoup this cost within 1 year by starting my own organic vegetable seedlings, rather than buying them from the local nursery. If you know me at all, then you know I’ll go-big-or-go-home. This project was no exception. I took over 4′ of space on our buffet counter in the dining room because it was located near an electrical outlet and it’s a convenient height for nurturing the plants. Large dinner parties that I host in the next few months, will have to be guest self-serve from the kitchen stove affairs 🙂 I knew that I needed something to hang the fluorescent fixtures from, but I didn’t want to screw hooks into the upper buffet cabinets. Instead, I built 2 squares from scrap 2×4’s that measured 16″ wide by 18″ high. These square blocks make the lighting system completely free-standing. 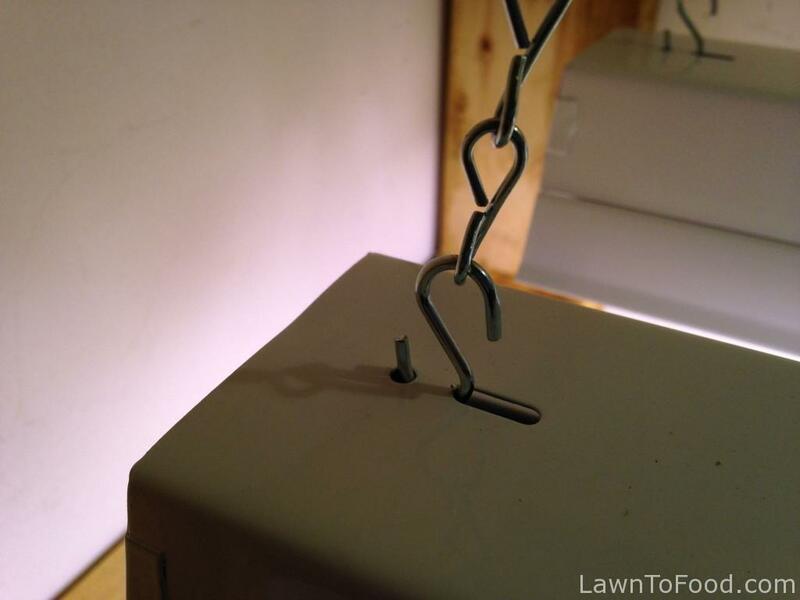 The picture below demonstrates one piece of 2×2, that is 54″ long, with 2 nails that hook the chain, to suspend the light fixture. I screwed the 54″ piece securely onto the 2×4 squares so that it won’t roll, or move out-of-place. Then, I placed the another 54″ piece of 2×2 on the 2×4 squares and secured it into place for hanging the second fluorescent fixture. The trickiest part of my whole HomeGrown GrowLight adventure was attaching the S-hooks. Go ahead, try to attach an S-hook and chain, to the light fixture WITHOUT dropping the S-hook through the hole, into-never-to-be-seen-again fluorescent light fixture abyss. Of course, I did drop an S-hook through the hole (maybe more than one) and was unable to retrieve it … !#%&*@! Now what was I going to do? The chances of me actually finding a suitable replacement S-hook in the man-cave-workshop were slim-to-none, so I looked in my office for inspiration instead. What I found turned out to be a brilliant solution. 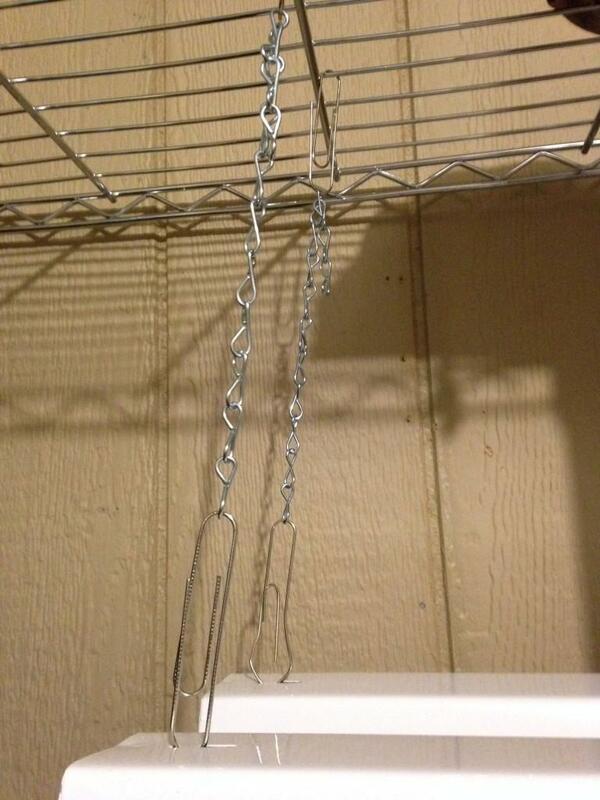 I highly recommend this idea for any of your S-hook needs. TaDAA! Extra large paper clips. 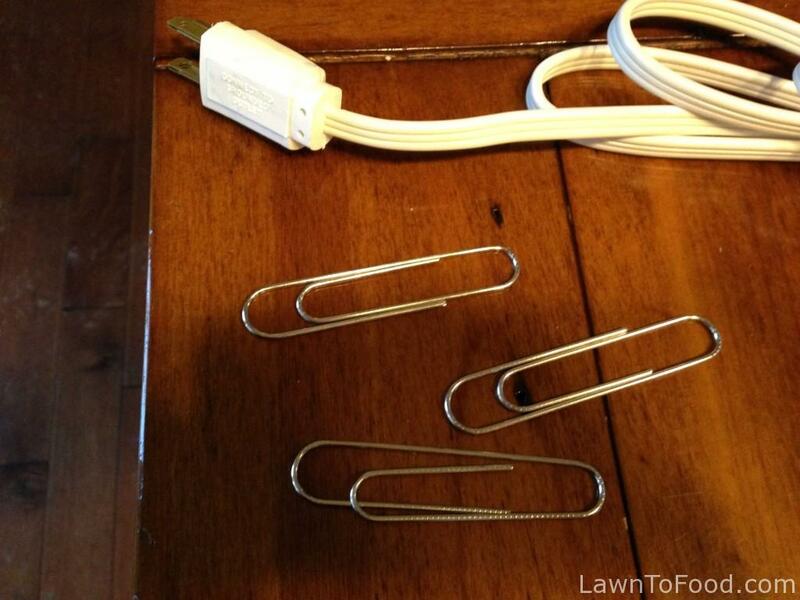 Open the extra-large paper clips, and push them into the slot opening on the top of the light fixture. 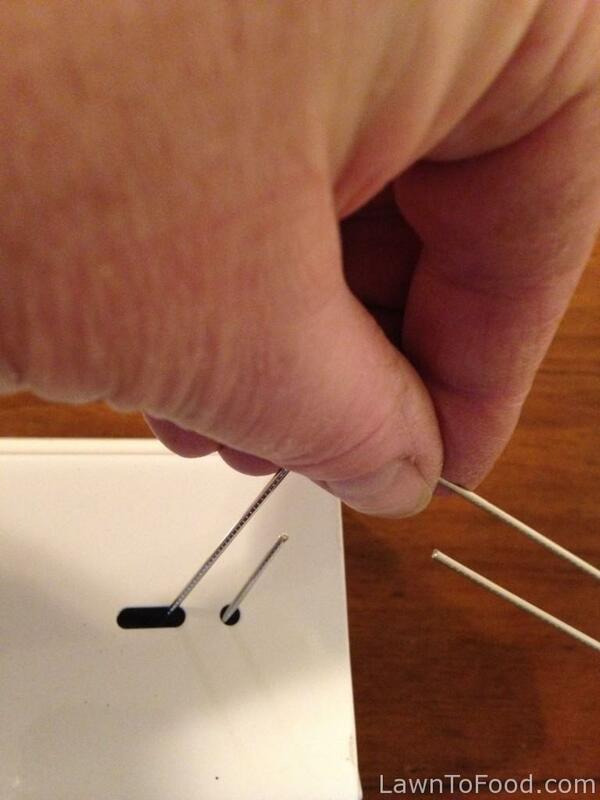 Then angle them back and then hook them through the hole. 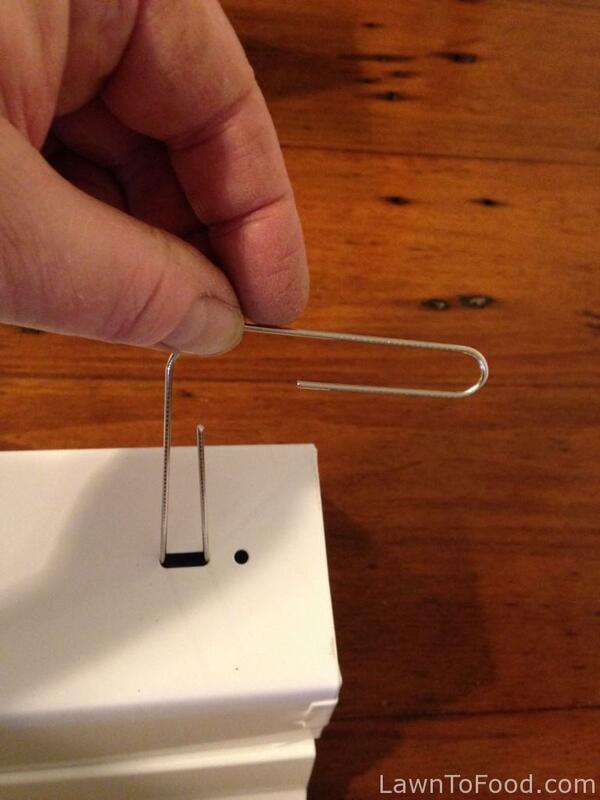 Once the paper clip is through the hole, it’s fairly easy to loop it around and squeeze it back together until it looks like a paperclip again. This will not fall through the fixture’s hole and is super convenient for securing the hanging chain and later, adjusting its height 🙂 I also added paper clips to the top of the chain for a cheap and easy way to suspend the light fixture on this wire rack shelf. 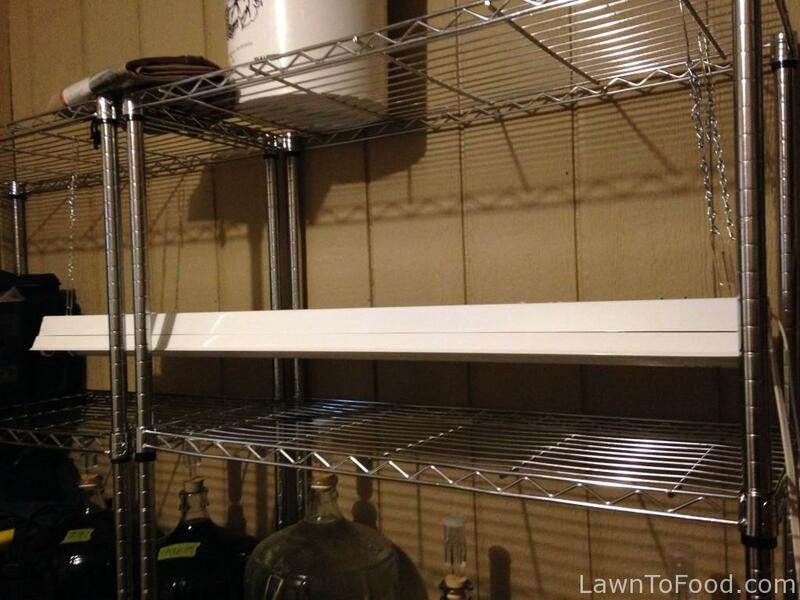 These 3′ wide wire-rack shelves are set up in our porch & wine storage room. 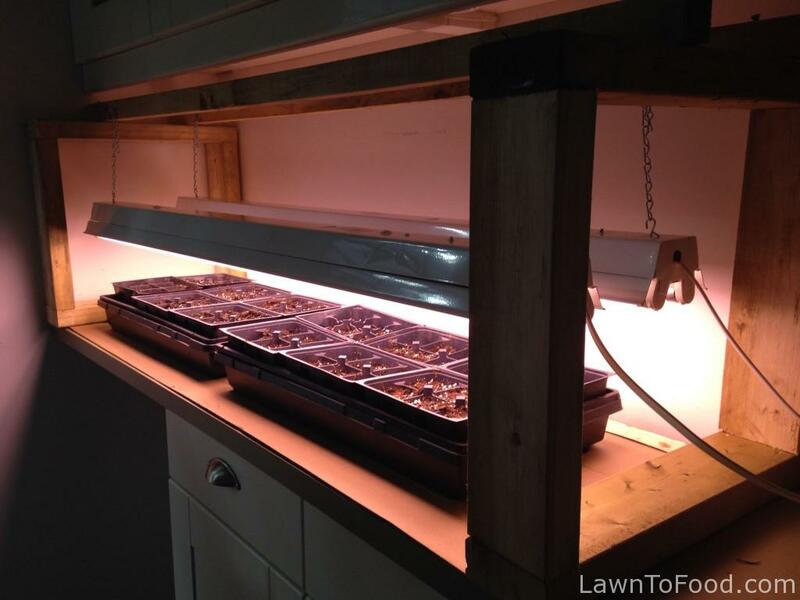 I moved all of hubby’s stuff off of a 4′ length of shelving and then set up my second set of grow lights there. This room is quite a bit colder than the rest of our house, so in here, I will move well established seedlings that prefer cooler temperatures. 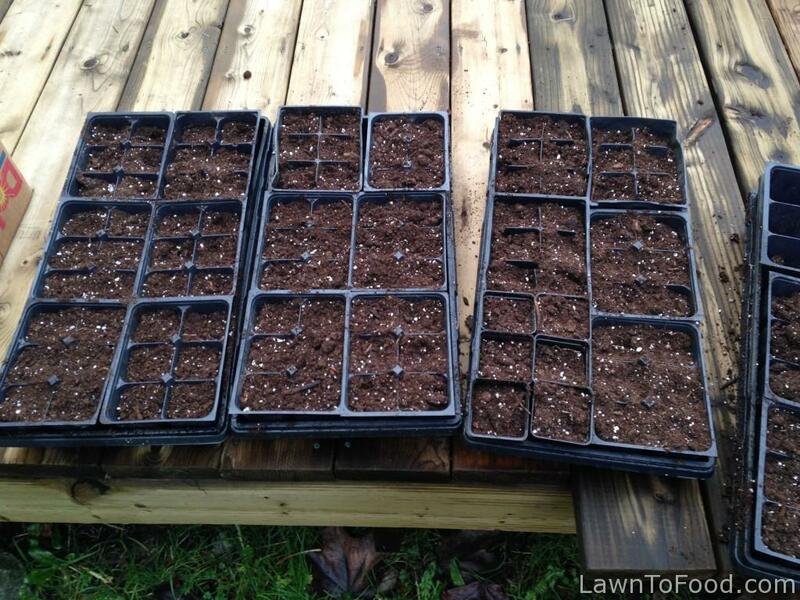 Outside on the deck, I filled containers with organic seed starting soil mixture and watered them thoroughly with the hose. After pouring off excess water from the tray bottoms, I brought the containers indoors and let them warm up for 24 hours.